A few months ago, I spent a few days visiting some of my favorite high school teachers and discussing just general things during their off period. One of those conversations was with my sophomore year Film teacher; we compared attitudes to how we find film. She contrasted how while she tended to flock to a film upheld by masters in the craft, she believed that I instead skewed more towards using my flippant taste to first research a film far before I watched it. In a sense, I agree with this idea, for I rarely limit myself to what I watch within some form of quality. That might by why I find the historical film creation of 1989’s Santa Sangre (Spanish for Saint Blood) so interesting. 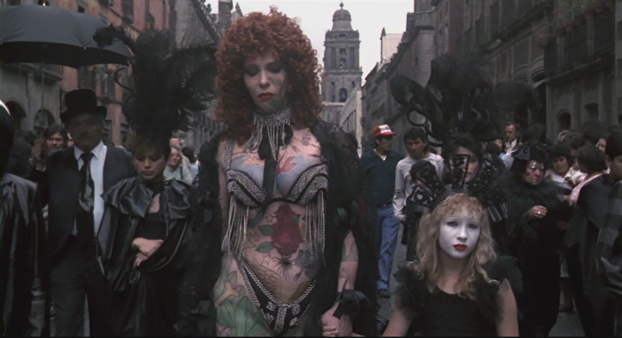 Santa Sangre was directed by the multifaceted Alejandro Jodorowsky, known for the early seventies films El Topo and The Holy Mountain. The Chilean born Jodorowsky spend a lot of time in France, a level of immersion that left him with full French citizenship and a Science Fiction comic The Incal written completely in French. Another person to note is Italian producer Claudio Argento, whose connection to his brother, the Italian Horror director Dario Argento, will become more apparent once I start talking about Santa Sangre in more detail. Just to clear something up, since Santa Sangre is a Mexican/Italian co-production, and while there are full audio tracks for both respected languages, the film is filmed originally in English. Fenix is a young man confined to a Mexican asylum where day after day doctors try to bring him out of his bewildered monkey-like mental state – his room is outfitted with a specifically tailored basket and a nine feet tall tree that he likes to sit in and he eats raw fish. From there we flash back to his childhood, a time where he grew up as a circus musician, who while living with his distant knife-throwing father Orgo and acrobat with a cult leader hobby mother Concha, finds only friends in both Aladdin and the clowns. Fenix’s young life starts to be thrown into turmoil over various major events: from watching his mother’s church bulldozed, to having a grandiose funeral for one of the circus’ elephants entailing a construction trash container sized coffin, to finally the dissolution of his parents’ marriage at the hands of Orgo’s affair with the circus’s tattooed-woman, and ending with the girl that he liked named Alma being taken away. Flash forward back to the present where we see that Fenix’s residence is more of a care center for patients (who my father watching with me at the time noticed) recognizable as having Down’s syndrome. Fenix later that night attends the movies with some of his fellow patients, who are intercepted by a pimp trying to reap money from them. This succeeds and once Fenix’s fellow patients leave alone on the streets of Mexico filled with bands and ladies of the night he spots the tall figure of the tattooed-woman from his childhood dancing with the pimp he just meet. In that moment Fenix is thrust out of his perpetual dazed existence and leads him to not only start up his life again as a performer, but open his mind to inner turmoil connected to his mother’s hatred for his father, resulting in the end of any woman. Santa Sangre seems to be a hodge-podge of visual concepts and technique. I brought up earlier that Claudio Argento was involved, and to me this connection to Dario Argento’s Giallo Horror films explains many elements found in Santa Sangre. Starting at the half-way mark, murders are carried out shot with a Giallo influence; the disembodied hand stabbing at the victim over and over as the victim dramatically screams and rushes around the room. 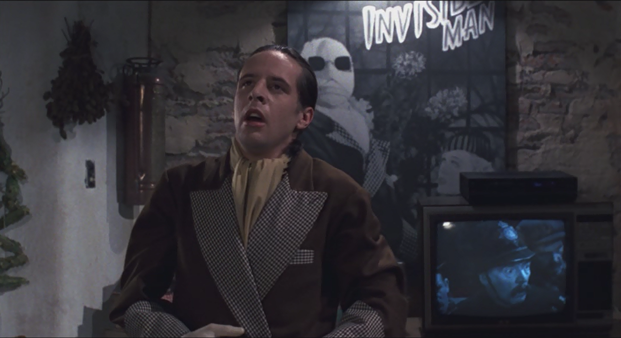 There is also heavy reliance on the mental psyche of the main character Fenix, whose slip in and out of reality is not that of an acid trip, but the conjuring up of people that might not actually be there. Music plays a huge role in Santa Sangre it is played so often that, outside of even some musicals, the film is rarely silent. 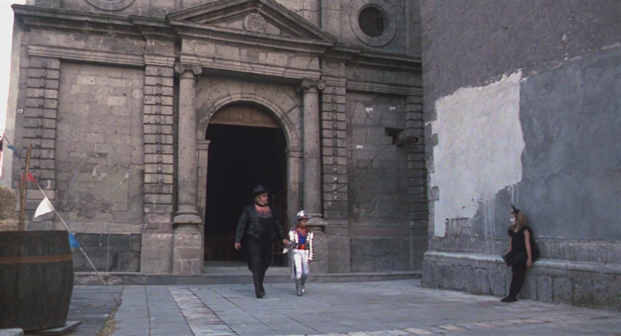 Jodorowsky seemed to like the idea of having mariachi bands just playing in either the background or front-and-center during certain scenes (there is one scene that still bothers me, where Fenix’s dad takes his mother away through hypnotism, all the while the band follows them and continues to play). From Mexican guitar and casonets to eighties synthesizer to even piano duets, the music ranges from cheery and active to moody and sluggish. Pros: An interesting blend of both Mexican and Italian influence that is both visually and audibly its own. Introduces random concepts, but goes the extra mile to actually incorporate them into the narrative where almost everything has a reason to appear. Incorporates violence and sexual perversion into its narrative without becoming in cumbered. Cons: The first time viewing the flash backs and not knowing that these out of nowhere sequences actually mean something makes the first thirty minutes a slog to view. This goes as well as for scenes after this where the screen transitions are a confusing. Just an audio nitpick, they dialogue and music tracks seemed to be uneven to a point where I had to turn the volume up then turn down various times while watching. Santa Sangre has a rather feature detailed two-disc edition from Severin Films that you can, and this counts for the fantastic soundtrack, find rather easily (not to mention you should be able to get it for far less than what I have written about when covering titles released by Severin). There are so many distinct things to talk about with regards to Santa Sangre that I could not fit in: from The Invisible Man reenactments being a comparison to personal feelings of worth, to growing up be just like your father, to everything in between. That is what makes this film so great that it is just as fun to talk about as it is to watch; Santa Sangre is pure film surrealism that speaks to my inner fanatic.